Today as part of our ‘From Stage to Celluloid’ series we discuss more on this landmark film. S.V.Sahasranamam was one of Tamil cinema’s most well-known character actors. Along with the likes of S.V.Ranga Rao and S.V.Subbiah, he was part of a select group of actors who were a constant presence in films between the 1950s and 1970s in the roles of a father, grandfather or elder brother. Born in 1913, Sahasranamam joined T.K.Shanmugam’s Balashanmukhananda Sabha at an early age, giving up schooling to become an actor. His association with the troupe was a long one, lasting for more than two decades. It was an association that got him his first film opportunity, when a play of theirs, Menaka was made as a film in 1935. It was also in this troupe that he forged a lasting friendship with the legendary N.S.Krishnan. Sahasranamam quit the Balashanmukhananda Sabha in 1936 on account of a misunderstanding with the managers. After stints as a manager with a couple of film houses, he joined N.S.Krishnan, by then a star, as a manager in his production house Ashoka Films. Film opportunities kept coming his way and he acted in a number of films through the 1940s. His passion for stage however remained undiminished. His dream of establishing his own troupe bore fruit in 1953, when he started Seva Stage. Starting with Kangal, an adaptation of Rabindranath Tagore’s short story Vision, Seva Stage made a name for itself with its social themes and brilliant execution of the technical aspects. It was also to Sahasranamam’s credit that he managed to get noted writers such as T.Janakiraman, Ku.Alagiriswami and B.S.Ramiah to script successful and critically acclaimed plays such as Naalu Veli Nilam, President Panchatcharam, Vadivelu Vaathyaar and Policekaran Magal, which were later made into movies. B.S.Ramiah, born in 1905 was an acclaimed journalist and writer best known in the literary circles for his association with Manikkodi, the magazine started by “Stalin” Srinivasan in 1933. He had made a name for himself as a short story writer. Sahasranamam approached Ramiah with a request to write a play for Seva Stage, thus marking the beginning of an association that would go on to produce great hits on stage. 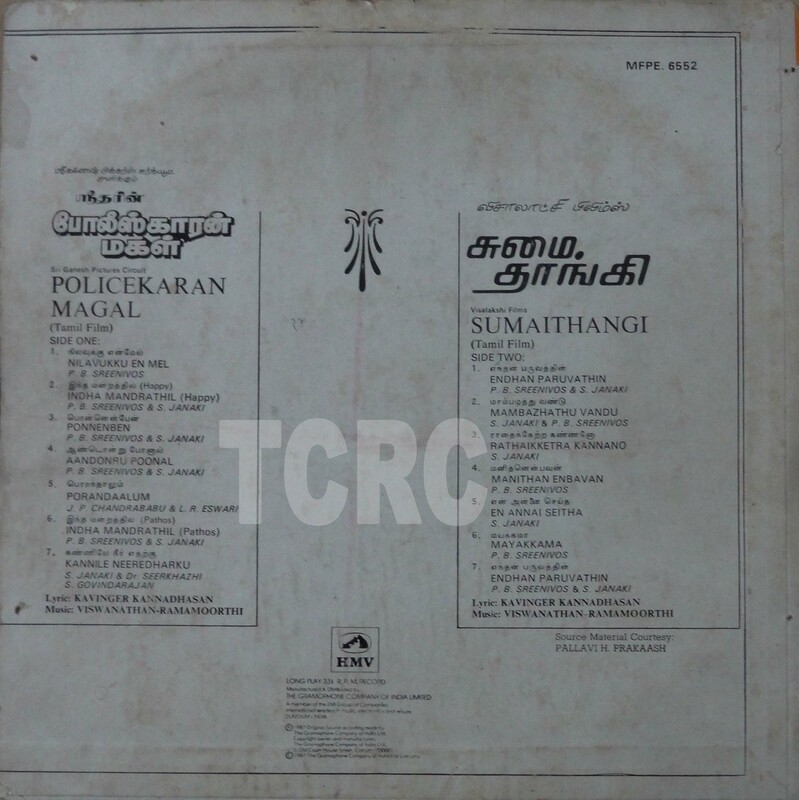 Policekaran Magal was Ramiah’s fifth script for Seva Stage, after President Panchatcharam, Malliam Mangalam, Therotti Magan and the critically acclaimed Paanchali Sabatham . Revolving around a policeman and his family (most prominently the daughter), the play was a great success. Like other Seva Stage plays, this too did not lack in star value, with noted actors Muthuraman and V.Gopalakrishnan and actress S.N.Lakshmi playing important roles in the play. Muthuraman went on to play a role in the movie too, which was directed by C.V.Sridhar and came out in 1962. Vijayakumari played the role of the daughter in the movie, which was played on stage by Shanthini, a Seva Stage regular. J.P.Chandrababu and Manorama played the role of flower vendors, a crucial part of the plot. Sahasranamam reprised his stage role of the policeman on screen and even today, this movie is often spoken about as one of those movies which is impossible to remake thanks to the powerful portrayal by Sahasranamam. The movie is also remembered today for its immortal melodies, most particularly Pon enben siru poo enben and Nilavukku en mel ennadi kovam. Here are pictures of the film’s LP from our collection. 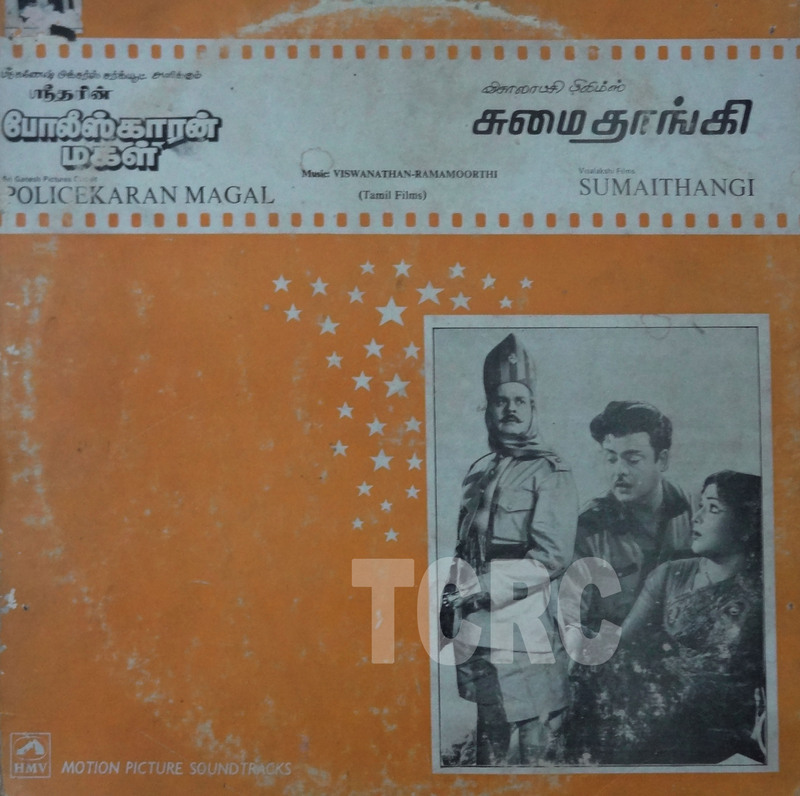 The LP also carried the songs of another popular film of the time’ Sumai Thangi’.